This year once again, thanks to the support of the Arts Division of the Austrian Federal Chancellery, the ZONE1 exhibition format provides an extraordinary opportunity to discover the work of young Austrian artists. With ZONE1, VIENNAFAIR The New Contemporary(organized by VF Betriebsgesellschaft mbH) and the Austrian Federal Chancellery support the careers of young Austrian talent and galleries. This platform provides extensive insights into new forms of artistic production and offers artworks at a reasonable price. Alfredo Barsuglia will present a performance “Next to nothing”. Within 30 minutes the empty gallery booth will turn into an architectural structure with a garden view by using convertible materials. Next to nothing (dt. fast nichts) opens possibilities to encounter emptiness and space, to tell stories, which hadn’t been told, to provoke imaginations you haven’t thought before. The boundary between appearance and reality, between illusion and reality is a pivotal point of Alfredo Barsuglia’s work, which is why it is not surprising that his ways of working are often that of a film director or storyteller. Barsuglia’s installations are mostly narrative, but not before giving the viewer a linear plot or interpretation. The artist creates fiction based on subtile detail that raise questions for the viewer and offer room for interpretation. Claudia Larcher’s artistic work mainly deals with architecture. She is interested in places that are connected to history, familiarity and memory, questioning the meaning of “home“ and “identity“. The last years she was working in the field of (photo)collage, (site-specific) video animation and mixed media installation. She is doing live visuals in performances and for live concerts. Tina about her works: Topography of Light is my latest body of work. Instead of using the camera as an instrument to explore an individual face or depict personality a void is created in the centre of the picture. This effect is achieved by the simplest of means; using my own requisites that call to mind sculptural surfaces the portrayed person is radically reduced to a geometrical configuration defined only by light and shadow, edges and planes. This alienation explores the interface between representation and abstraction. If there remains a characteristic utopian undertone within Misha Stroj´s art it is one of a positive utopia made of visible and concrete ingredients, of appropriations and processes rooted within the space of shared human experience. It is therefore not a suggestion of abstract and idealistic hypothesis but based in perception of the value of profoundly human stories, artefacts, conversations and interactions. (Luigi Fassi, 2012). Lukas about practice: “Growing up in Munich, Germany, I got in touch early with graffiti and street art. Travelling somewhere always offered me a colorful world outside the car or train windows. When i took the suburban trains to my dad’s place, I could see all the pieces that Munich’s writers had left there the night before. I was fascinated by how quickly and clean these people had painted those masterpieces. Some years ago, when I started studying sculpture, I thought about how to combine my graffiti background with my studies, where I exclusively worked in third dimension. Markus Hanakam & Roswitha Schuller’s works are focused on aspects of popular culture, challenging the role of the artifact therein; as marketing tool, as gaming device, as apparatus, as fetish. Questioning the status of the object they experiment in a reflection on, – or an ironization of – different historical and contemporary artistic strategies, as well as their means of expression. 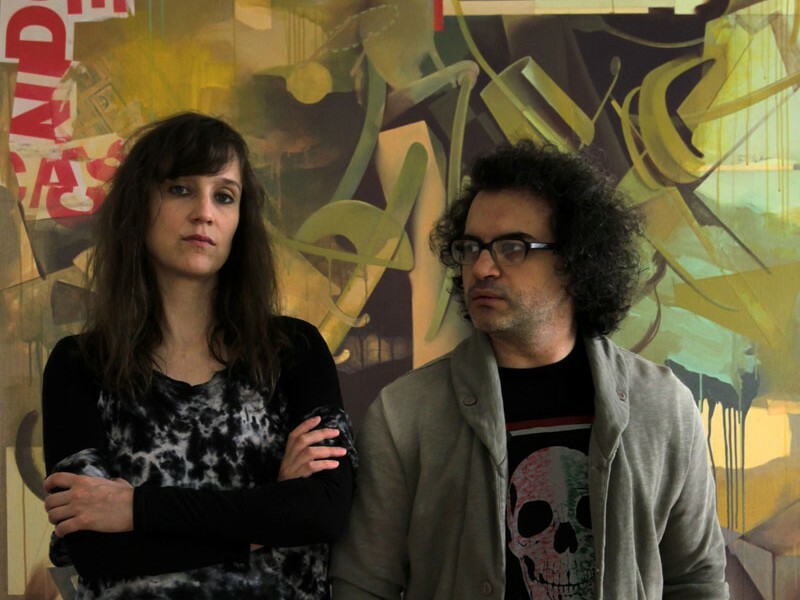 The artists mainly work with video, interactive computer applications and applied art forms. They gained several awards like the MAK Schindler Fellowship in Los Angeles as well as an Artist in Residency at the Citè International des Art, Paris. Their short Film “INVASION” is awarded as Jury Selection Work at Japan Media Arts Festival 2012. Bernd about his work: In my current work I focus on the cinematic use of space and architecture, the perception and change of it through the medium of film. I refer to personal experiences of a space as well as collective illusory spaces, as they seep through the mainstream cinema in the collective subconscious. Currently I deal with transitional spaces, temporary staging, waiting rooms and passages. I reconstruct these spaces in scale models, in which I stage chaotic events and various substances. In combination with the interior structures are being formed, in which institutions thus transform. The presented works were produced during the last three years. Some were built simultaneously and others lead to one another. Those objects can be a starting point for a bigger project or a way to try out variations on a finished work. It became a kind of working procedure that’s been running on its own – along with the development of big sized installations. „Bergauf und bergab und bergab und bergab“ is an example for a larger sculpture, which is the result of the process described above. “Das beliebte Format” (the popular format) originates from a totally different concept, but uses similar shapes. Tags: Alfredo Barsuglia, Asgar/Gabriel, Austrian artists, Benjamin Hirte, Bernd Oppl, BM:UKK, Cäcilia Brown, Charim Galerie, Claudia Larcher, contemporary art, Gabriele Senn Galerie, Galerie Emanuel Layr, Galerie Ernst Hilger, Galerie Hubert Winter, Galerie Krinzinger, Galerie Lisi Hämmerle, Galerie Meyer Kainer, Galerie Michaela Stock, Julia Haller, Kerstin Engholm Galerie, Linus Riepler, Lukas Troberg, Mario Mauroner Contemporary Art, Markus Hanakam, Markus Hofer, Misha Stroj, Robert Muntean, Rosmarie Lukasser, Roswitha Schuller, Tina Lechner, Viktor Bucher, young art, ZONE1. Bookmark the permalink.